Volatility is back. And it has not gone unnoticed. As the VIX index spiked to above 25 for the first time since June 2012, US equities plunged 8% since the beginning of September. We have seen somewhat of a rebound in recent days, but it looks far from solid. And, thus, stories about the benefits of volatility investing are popping up again. True, when market turmoil rises, volatility provides a good hedge against falling equity prices. When implied volatility rises, risk premiums go up and stocks fall. 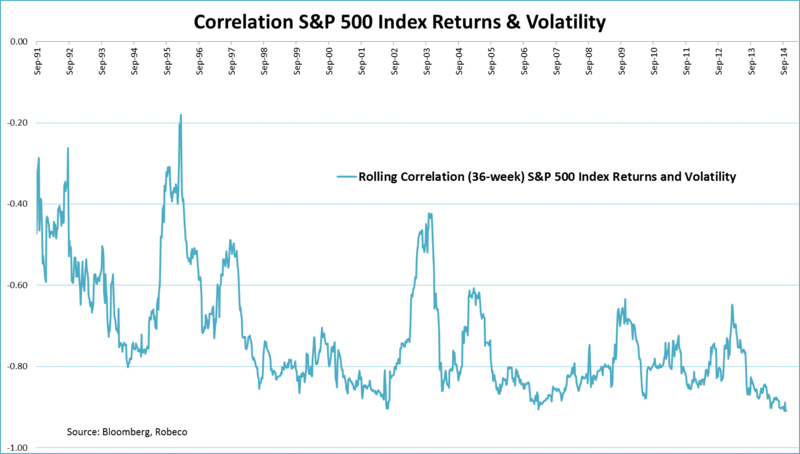 The graph below shows that the correlation between equity returns and VIX changes moves around -0.80, most of the time. That’s pretty significant. Being invested in stocks automatically means you are short volatility. Hence, adding the VIX index to your portfolio would diversify risk. Theoretically, there is nothing wrong with this notion. But, putting things into practice is where issues occur. Since the (spot) VIX is not tradable, investors have to turn to derivatives, instead. One possibility is to buy options on the S&P 500 index. However, the exposure to volatility you obtain by owning index options is impure: the options provide index level risk, dividend risk, interest rate risk and also volatility risk. To get rid of all the other, undesirable, exposures is complex. In addition, you are forced to think about the maturity and strike levels of your option, unwillingly making timing and forecasting part of the diversification process. Back in 2006 the Chicago Board Options Exchange introduced options with the VIX as the underlying asset. Although investing in VIX options reduces some, but not all, of the undesirable exposures mentioned above, it also raises the question what it is you are hedging. The VIX index represents the implied volatility of the S&P 500 index, the stock market risk you want to hedge. But options on the VIX index involve the implied volatility of the VIX index as underlying asset, and not that of equities. But, even if we forget about these issues, there is an even more important factor you should take into account when investing in volatility. As mentioned above, investors that are long equities are short volatility, and because of their desire to hedge that risk they are willing to buy volatility at a premium. This ‘volatility risk premium’ is exactly why, on average, the realized volatility is lower than the implied volatility. The graph below shows the realized volatility on the S&P 500 index against the VIX index. The difference between the two represents the volatility risk premium. The existence of the volatility premium implies that long investments in volatility are destined to lose money. Let’s take a look at the volatility futures market. Just like in the options market the implied volatility represented by VIX futures is higher, on average, than the realized volatility. Investors who go long VIX futures pay a premium to hedge their risk, and this premium is collected by investors that short the futures. Let’s take a look at an example using VIX futures. First, it is important to note that the volatility risk premium is not the same as the roll yield, which results from rolling the future close to settlement to the future further out on the curve. 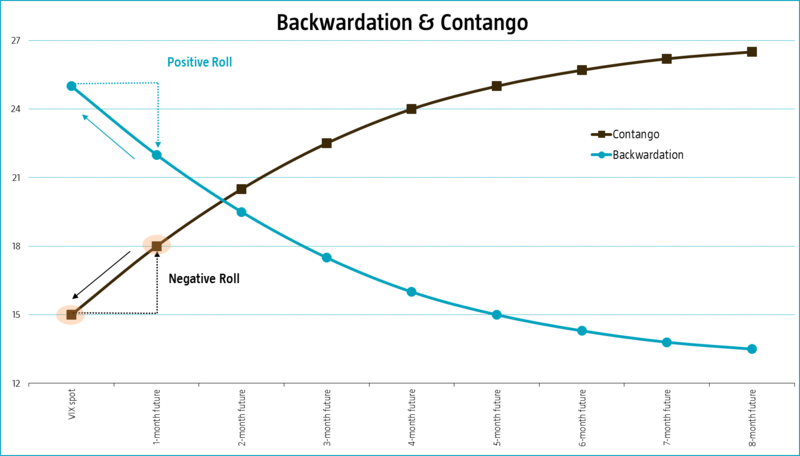 A future curve is either in backwardation, the future curve is downward sloping (positive roll), or in contango, the future is upward sloping (negative roll). For instance, take a contango curve where the spot VIX index is at 15 and the future price is 18. The futures price of 18 represents the market expectation for the VIX. If the market proves to be right the VIX spot will move up to 18 as settlement nears. In this case the spot price movement and the roll yield cancel each other out. The futures price stays exactly at 18 until settlement. In practice, however, things are different. Most of the time the VIX futures term structure is in contango, but prices will not, on average, rise to 18, as in the example above. Suppose it rises to 16. The difference between the futures price of 18 and the final spot price of 16 represents the volatility risk premium. The buyer of the future will lose this premium as the future falls from 18 to 16, while the seller of the future gains the premium. Again, investors that are short volatility are willing to pay a premium in order to hedge their risk. Now, the proof of the pudding is in the eating, right? The graph below shows the returns of an ETF that invests only in long positions in VIX futures (black line) and of an ETF that consistently holds short positions in the same futures (blue line). The return difference between the two ETFs is mind-blowing, confirming the previous statement that investors are willing to pay a premium to hedge volatility risk. There is one thing to keep in mind here, though. 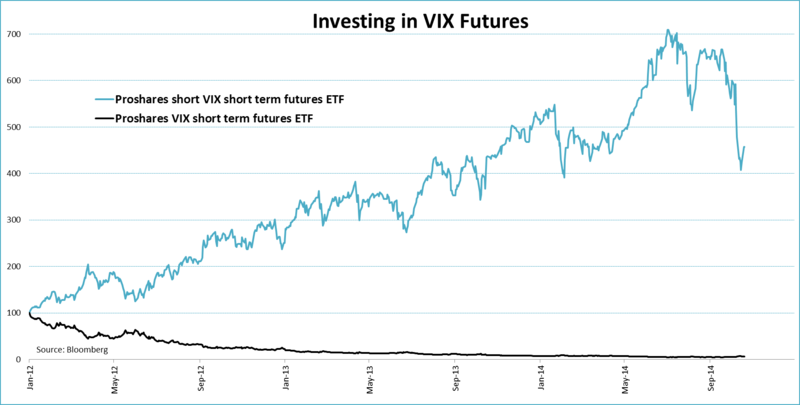 Shorting VIX futures is like picking up nickels and dimes in front of a steamroller. Whenever volatility spikes, shorting the VIX can cause serious damage. In most cases a sharp increase in the VIX index is accompanied by a reversal of the futures curve from contango to backwardation. When this happens losses are magnified as roll returns become significantly negative due to backwardation. Just take another look at the ETF graph. In recent weeks the VIX index spiked to over 25 pushing the future curve into backwardation on the way. This resulted in heavy losses for the Short VIX ETF. So, in tranquil times you realize steady gains by picking up the volatility risk premium, but when things really get ugly you get hit disproportionately hard. While investing in a long position in volatility might look appealing from a diversification perspective, reality is less straightforward. On average, going long volatility implies you pay a volatility risk premium to hedge your risk. Over the long-term shorting the VIX is a profitable strategy, but it requires a very strong stomach as this investment strategy gets you hit by a steamroller once in a while. 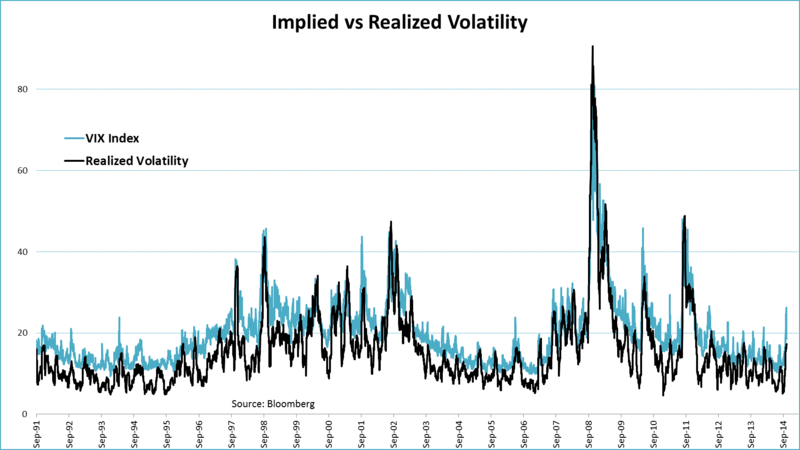 ← Week End Blog – Volatility, back with a Vengeance!